San Diego Restaurant Week is continuing all this week. For my final outing, I chose one of San Diego's highest rated steak houses, Donovan's Steak and Chop House located in San Diego's famed Gaslamp district. San Diego Restaurant Week is a great way to experience one of San Diego's many restaurant's at a discounted price. I was so glad I decided to treat my husband to a night out at a place I knew he would love and it was a treat to experience San Diego Restaurant Week at one of San Diego's most highly regarded restaurants. Donovan's is known for their intimate atmosphere. The walls are covered in rich and warm wood with classic detailing. There are several cozy seating areas as well as an ample bar area. It's private without being secluded. Donovan's is also very close to Petco Park, within walking distance in fact. The Restaurant Week options at Donovan's offer your choice of a salad, entree and dessert. Warm bread is offered upon being seated. We both chose the caesar salad to start. My husband dined on the 4 oz. 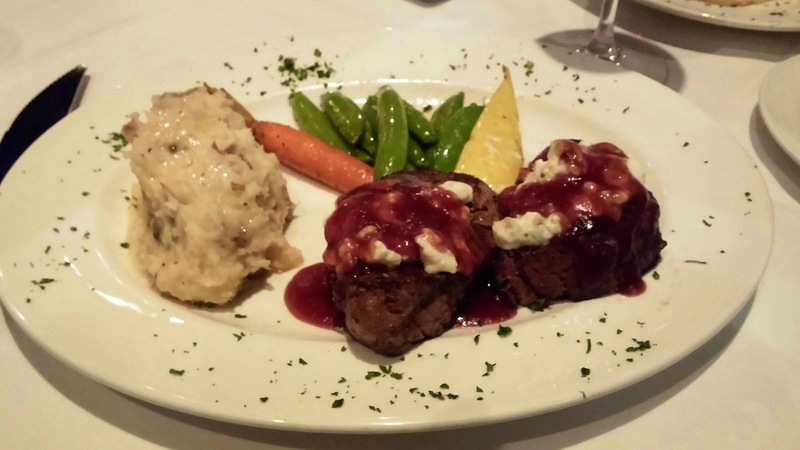 twin prime filet medallions topped with bleu cheese and a delicious port wine demi-glaze. He likes his steaks medium rare and he said this one did not disappoint. It had a perfect warm pink center. It was served with crisp seasonal vegetables and garlic smashed potatoes. I had the scottish loch salmon with maitre d' butter. It was deliciously buttery soft and flaky. I chose the seasonal vegetable and the garlic smashed potatoes. the vegetables were perfectly crisp without being underdone and the garlic smashed potatoes were piping hot and so good! Click over for the full San Diego Restaurant menu. Expect unparalleled service at Donovan's Steak and Chop House . The server's work in teams of three with a lead server on point. This ensures you are never without anything you need during your meal, whether it's a refill on your water, your plate cleared or another glass of wine. Our server, Erik and his team truly went above and beyond to provide a first class experience. Disclosure: I was invited to have a complimentary dining experience at Donovan's by the folks at San Diego Restaurant Week. My opinions are my own.